Just to be upfront, this is my opinion based on my own experiences and what the expected service levels are according to Microsoft’s own reps. I think you will understand why I came to this conclusion and think they, at worst, may be dealing with a significant increase in fraudulent activity with Xbox Live IDs recently. At best, Microsoft is woefully understaffed and apparently hasn’t learned a thing from the RRoD mess. Quality customer service and quick turnaround times mean more to the customer than why something was able to happen in the first place. 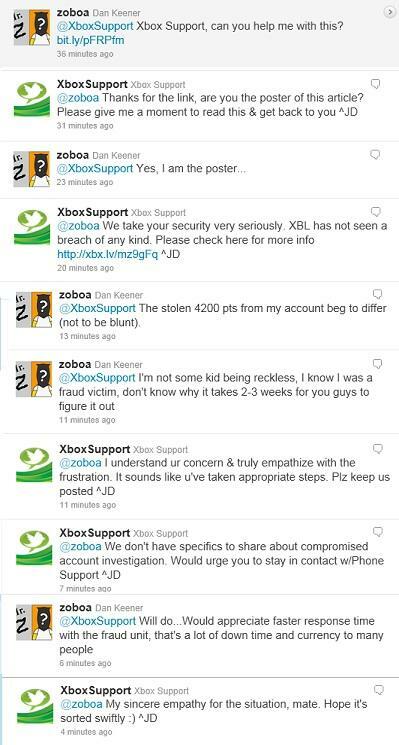 As you probably figured out from the title, I had another bad experience (RRoD experience was awful) with Microsoft Support due to me being the victim of Gamertag fraud via Microsoft’s Xbox Live system. In hindsight I should have figured this out about a week and a half ago when I went to log into Xbox Live to view some Netflix. I hadn’t been using the 360 for reviews lately so I was a bit surprised to find that my Gamertag wasn’t loading and it was asking me if I wanted to recover it. So not thinking anything of it, I recovered it and went on my way watching movies, playing Kinect and other things for the several days thinking it was nothing more than a save glitch on my memory unit. Fast forward to today, where I read an e-mail from Microsoft about some changes and improvements to their Xbox Live Rewards program. So I logged into my account and was checking it out when I noticed my MS Point balance was a mere 10 pts. I knew that wasn’t right, because I loaded a 4000 pt. card into my account at the end of June to get ready for all the excellent Rock Band DLC coming down the pipe in July. So after some digging on Xbox.com in my account, it turns out someone had used my Live account to buy a bunch of FIFA 11 DLC and stole over 4200 pts I had on my account. For anyone that wonders why I have always maintained I will not put a credit card on my Xbox Live account (or PSN or Wii Shop), now you know why. They probably would not have stopped downloading stuff until all my MS Pts and my credit card were cleaned out. I called it in to 1-800-4MyXbox and they proceeded to take all of my info that would be needed to start an investigation and research the issue. I was told that in most cases, this fraud was because people shared their gamertag/password with someone for leveling, items or gold and got ripped off. Of course this wasn’t the case with me, but it makes sense with players always looking for a shortcut instead of earning it. At the end of the conversation, the rep says that during the investigation, my account would be locked and any site that authenticates with Live ID would not be accessible. I knew this was standard and was thinking a couple days, but the rep proceeds to tell me it will take two to three WEEKS to do the investigation. So during this time, Hotmail, Xbox Live, Microsoft ExpertZone (retail training site), Games for Windows (G4W), Zune.net and MSN accounts will all be inaccessible to me. I was told I would be compensated the corresponding Live Gold time that I was down, but the answer was silence when I asked about my Netflix subscription, the time that I will be unable to review games on my 360 or train on ExpertZone for my retail job while this is ongoing. I guess Microsoft apparently still doesn’t “get it” when it comes to customer service. You cannot leave people twisting in the wind for extended periods without upsetting them (right Sony?) Right now, as a retail employee that is supposed to be training to actively sell their products, a gaming journalist that is supposed to be using their hardware and equipment to review games and Audio/Video gear as well as a just a gamer, I have a bad taste in my mouth from Microsoft…again. Now that my lack of patience with MS has been stated, here comes the part where I speculate that Microsoft has some sort of issue on their hands. I was perfectly fine with not having access for a few days, but 2-3 weeks seemed excessive to me and I asked the rep about it. He stated that it usually takes seven days or less for an investigation, but right now it is 2-3 weeks. So I flat-out asked him if Microsoft is experiencing a major uptick in fraud complaints, as it seems that a 200% increase in time to resolve the issues was something to be concerned about. He didn’t have an answer, nor did I really expect him to. However, something is amiss at Microsoft right now and it is impacting their service levels and anyone that is a victim of fraudulent activity. It is also one-stop shopping for thieves to gain access and control over everything that system touches. Having said that, two huge pieces of advice I can share would be to change your password every so often and keep it strong. Secondly, if you have a credit card (or worse a debit card) attached to any account that is protected with Live ID, consider pulling it and going to the pre-paid cards. You can proactively do yourself a favor and help prevent fraud, major downtime of your accounts and temporary financial loss.